Edward VIII & Wallis-Simpsons Country Retreat. Take a journey back through time into the most romantic love story of the 20th Century. 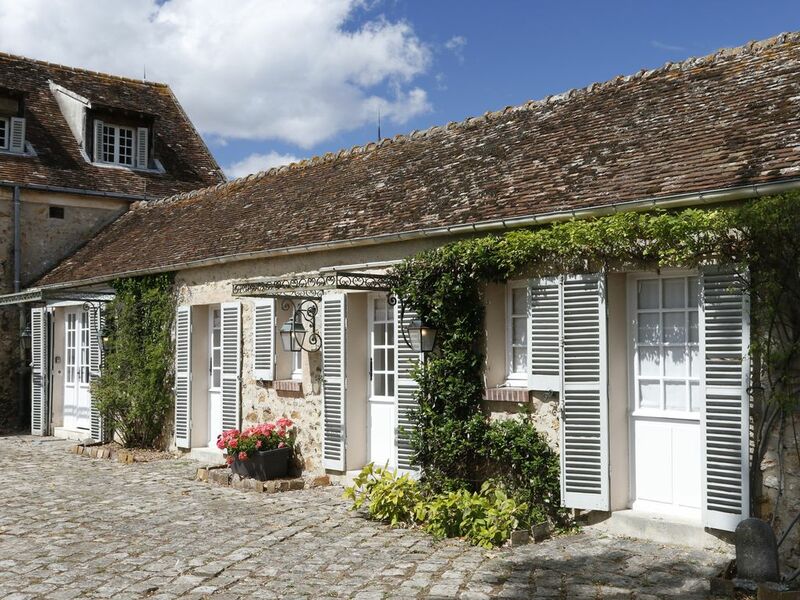 One of two properties we currently let on this beautiful estate, The Stables forms part of Le Moulin de la Tuiliere and is set within a secluded courtyard of six stone properties on the outskirts of the small town of Gif-sur-Yvette, just 30 minutes from Paris. The extensive grounds with meandering streams and large landscaped gardens open up to beautiful views of the picturesque valley and its own Ancient rocky woodland. The Stables was originally converted by the Windsor's as guest accommodation and its in this format that it remains today. It has its own private terrace, set astride the original mill race with BBQ and table and chairs. It is a single storey converted stones stables with bedroom accommodation on the one level which makes it ideal for people with mobility issues. The Stables has a modern kitchen with breakfast bar and a dinning/lounge area leading through French doors onto the terrace. The dining/lounge room also looks through French doors giving views onto the main courtyard. The corridor from the kitchen/dining room leads you to the first double bedroom and bathroom, then a storage cupboard for coats and bags followed by the second bathroom and the master bedroom at the end. Both bedrooms have a view of the mill race and surrounding countryside. The bedrooms both have built in hanging space and chest of drawers. he bathrooms retain the original Windsor bath suites and shower over the bath. Activities: Tennis court on site. Play golf at Le Golf National home to the Ryder Cup 2018, Horse riding/trekking, hiking, Mountain biking, Cinema. Thank you for review, please you enjoyed your stay. Hope to see you again in the future. Very comfortable and well-equipped. Superb welcome pack. Very, very clean. Warm and lashings of hot water. Friendly staff on hand. Thanks David pleased you enjoyed your stay hopefully we'll see you again in the future. Fantastic character property in a great location for exploring Paris! We had a lovely break at The Stables with it’s fascinating history. In a perfect location with the RER line to Paris nearby. Everything you need is in the village, and I must mention the station employee who helped us with our rail cards ‘ Navigo Decouverte’ - brilliant! This 2 bedroom converted stables cottage has been finished to the very highest standard - it is simply beautiful. The outdoor area with barbeque overlooking the fields is gorgeous. The cottage is set in the most beautiful of surroundings, with plenty of parking and a restaurant within walking distance. Could not recommend this cottage more for a peaceful get away! Thank you for your lovely comments, so pleased you enjoyed your stay.